As part of the DFID project on Economic Impacts of Climate Change in Kenya, an analysis of the historic trends in precipitation, temperature and extreme events was undertaken, to identify how and if there have been any trends in cllimate variables over the last 40 years. In developing countries such as Kenya, the existence of historical climate data is often sparse, incomplete, and sometimes unreliable. This analysis is conducted with data available from multiple climate stations in Kenya, provided by the Climate Information Portal (CIP), CSAG and IGAD Climate Prediction and Applications Centre (ICPAC). 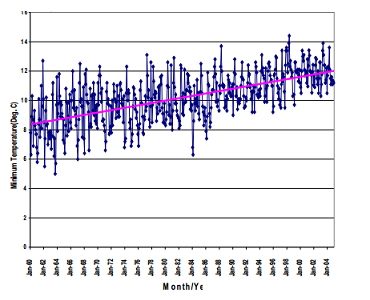 Observed station records form an important basis for climate analysis in an area. Unfortunately, due to a number of complex reasons, there is a lack of observed data in many parts of the world. Compounding this is the problem of poor quality records from many stations. Data quality problems either require a great deal of work to resolve these problems or else result in the exclusion of the data for analysis purposes. The data presented by the CIP have been extensively quality controlled. A large number of potential station data records have been excluded due to quality problems and only stations with more than 10 years of valid records are included. Corresponding data for these sites indicate a general increase in temperature since 1977 that has accelerated in the last decade. However while the overall average temperature has increased, the discrepancy between maximum temperature patterns and minimum temperature patterns is significant. A comparison of daily maximum temperatures from 1905 to modern times will show little difference, while the same comparison of minimums indicates a discrete pattern of gradual increase. Looking regionally at East Africa provides results that hint at night time warming and daytime cooling in recent years (although the opposite is true at fluvial sites). Temperature variability patterns showed frequent reoccurrences of extreme events linked in part to the unsettling effects of ENSO (El Niño–Southern Oscillation). Precipitation levels too reflect this pattern: both droughts and flood events were shown to be more extreme and frequent due largely to socio-economic strains coupled with climatic change.